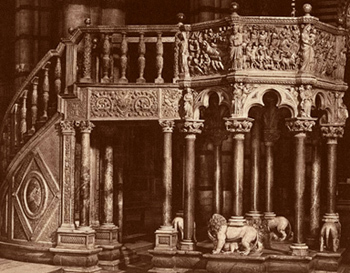 As the mendicant hanciscan and Dominican orders took more and more to preaching, special liturgical sites, such as the pulpit, took on greater significance. 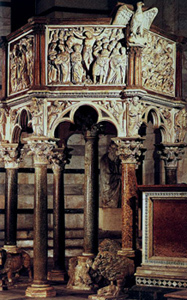 Through the works of the great Pisano family in Siena, Pisa, and Pistoia, the pulpit became the element that best illustrates the development of Tuscan sculpture. Nicola trained in the court of Frederick II. as the transference of the Castel del Monte architectural design to his pulpits at Pisa ( 1260)) and Siena (1265) would seem to indicate. 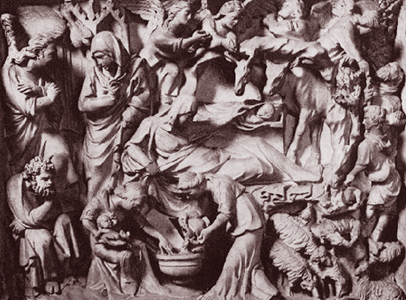 His Childboood and Passion of Christ reveal a compositional rigour and powerful relief work that are clearly classical in origin. 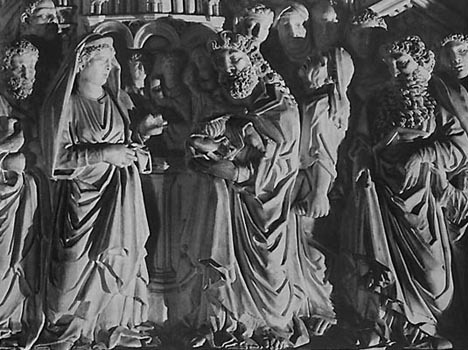 In his work on the pulpits of the cathedrals of Pistoia (1301) and Pisa (1302). his son Giovanni heightened these Gothic tensions. 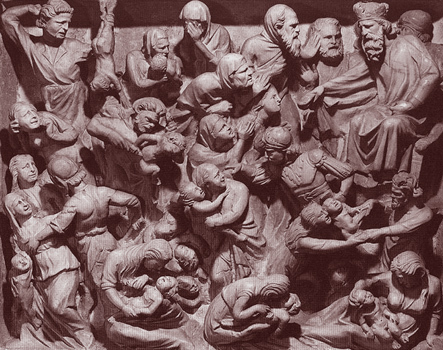 An impetuous, dramatic energy, centred on the major points, such as the Cross of the Passion of Christ, invests the figures with an amazing variety of effects and creates a strong sense of tragic power. 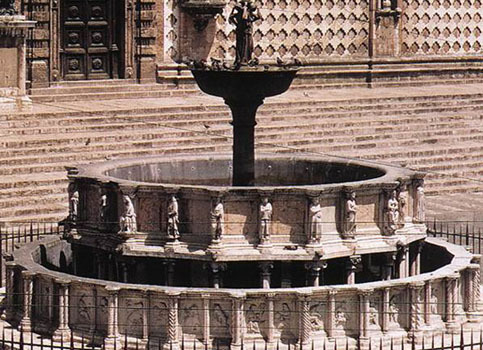 Baptistry in 1255 and completed in 1260, Baptistry, Pisa. marble, height cm 85, details of a figure on the pulpit parapet, Baptistry, Pisa. Annunciation, Birth of Jesus and Adoration of the Shepherds, marble, 1260, Baptistry, Pisa. Italian family of sculptors and architects. Originally from Apulia, Nicola Pisano settled in Pisa in the mid-13th century and from there undertook commissions in the major artistic centres of Tuscany, as well as in Bologna and Perugia. 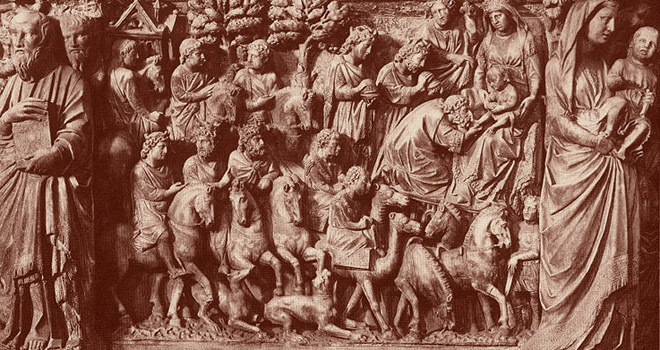 His work, which combined Classical and Byzantine-Islamic traditions with Romanesque and Gothic, formed a bridge between the Mediterranean and northern Europe, bringing Tuscany into the heart of European artistic culture. 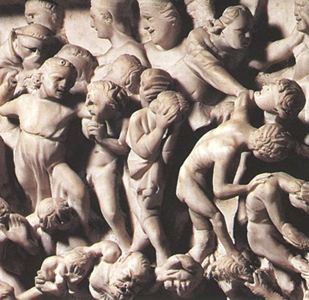 He recaptured the sense of dignity of late Roman sculpture, with its realistic spatial effects, and revitalized it in the service of Christian narrative. His style continued to have an important influence on architecture, sculpture, painting and metalwork for several generations, and was spread by his school, which included Arnolfo di Cambio, to Florence, Orvieto, Rome and Naples. Nicola’s son Giovanni Pisano was also active in Tuscany. He created a highly expressive and dramatic style, in which Nicola’s classicism was transformed by a more profound assimilation of Gothic art. (b c. 1220–25; d before 1284). Two documents drawn up in Siena on 11 May 1266 describe Nicola as 'de Apulia’; in his signed works and other documents he appears as "Pisanus". This has caused controversy over his origins, but he is now thought to have been trained in the Apulian workshops of Emperor Frederick II, perhaps those at Castel del Monte, and to have moved to Tuscany c. 1245, working on projects associated with Frederick, such as Prato Castle. 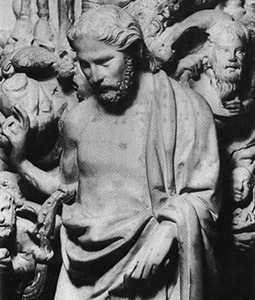 This would have brought him into contact with artists and craftsmen from the Mediterranean lands and from north of the Alps, where a new figure style was emerging in the cathedral workshops of the Ile-de-France and Germany; he would also have worked alongside Cistercian builders who later went to Tuscany under Frederick’s protection, to work at S Galgano Abbey, near Pisa. In the imperial workshops the representational traditions of Classical art were given new life and spiritual force, and there was concern to convey movement, emotion and the signs of age and illness. 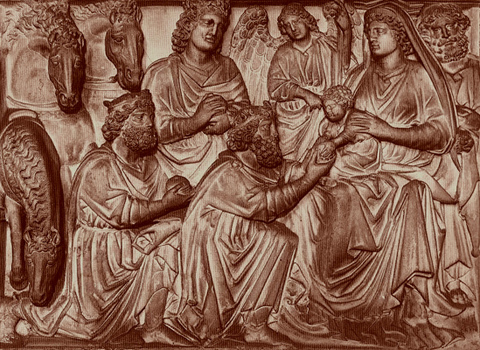 This new art was encouraged by Frederick, who favoured the fusion of Classical with Christian traditions as an instrument of policy. The lifelike features that characterize it can be seen, for example, in the Barletta bust (c. 1231; Barletta, Mus.-Pin. Com. ), which is almost certainly a portrait of Frederick himself, dressed as a Roman emperor: deep wrinkles line the face and the folds of the mantle seem to flutter in the breeze. 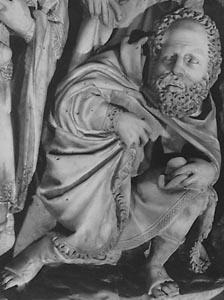 At Castel del Monte, the fragmentary ‘Molaioli’ portrait head shows the marks of age and suffering and the wrinkled telamons supporting the vaults are animated by violent grimaces. (b Pisa, c. 1245–50; d Siena, before end of 1319). Son of (1) Nicola Pisano. 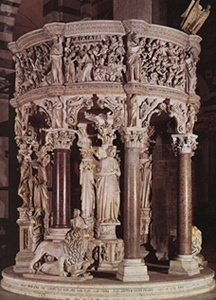 Giovanni Pisano is first mentioned in the contract for the pulpit of Siena Cathedral in 1265, which awarded him a higher payment (4 soldi) than Nicola’s other assistants Arnolfo and Lapo (6 soldi for both). He probably worked with his father on the altar of S Jacopo (1273; destr.) in Pistoia Cathedral before beginning work on the Great Fountain, Perugia (c. 1277–8). 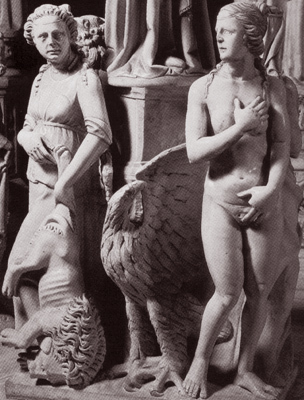 Initially Giovanni’s work was limited to carrying out Nicola’s compositions and following his models, but he soon developed a style of his own, identifiable even in the context of his father’s workshop, and he evidently enjoyed considerable autonomy on the Perugia fountain. He also benefited from contact with Arnolfo di Cambio, who was able to bring out the linear tensions inherent in Nicola’s more plastic style and to emphasize the geometrical structures underlying the forms. Especially after Nicola’s death, Giovanni developed an extraordinarily broad range of expression, carving figures that were solemn and contemplative or tormented and violent, often distorted and emaciated to convey emotion. 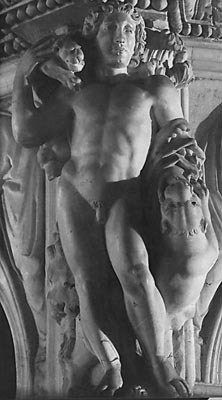 His motifs were inspired variously by Nicola’s severe and solemn classicism, by the agitated, dramatic sculpture of the Hellenistic and Roman traditions, and by French and German Gothic art. 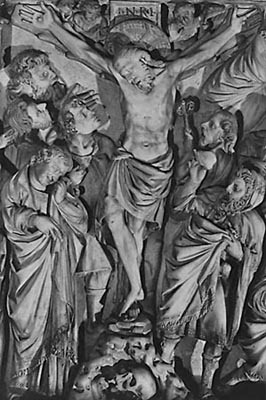 The inscription on Giovanni’s pulpit in Pisa Cathedral records that he was "endowed above all others with command of the pure art of sculpture, sculpting splendid things in stone, wood and gold". 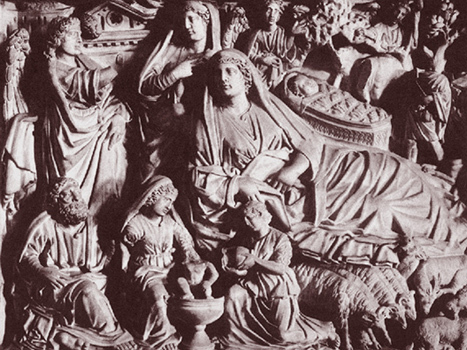 Story of the Birth of Jesus, 1298-1301, marble, Sant'Andrea, Pistoia. Museo dell'Opera del Duomo, Siena.